Students carry out three laboratory rotations during their first year (one during each quarter, 10 weeks in duration). In most cases students are able to "match" with a mentor after three rotations. Lecture, four hours. Essential aspects of toxicology with emphasis on the human species; absorption, distribution, excretion, biotransformation as well as basic toxicological process and organ systems are discussed. Letter grading. Students may take this course any time in their first two years of study. Lecture, six hours; laboratory, five hours total. Detailed examination of principles of pharmacology and mechanisms of drug action at organismal, tissue, cellular, and molecular levels, with emphasis on receptors, receptor/effector coupling, neurotransmitters, cardiovascular pharmacology, autonomic and central nervous system pharmacology. Letter grading. 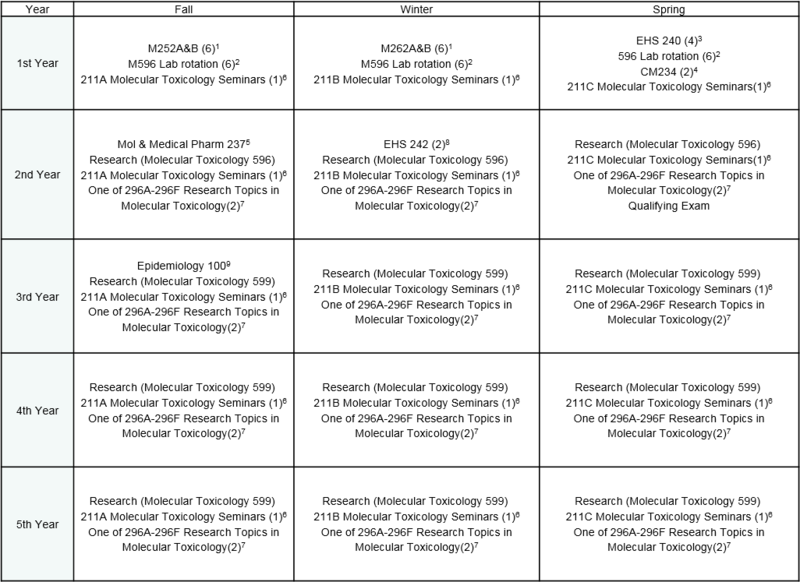 All Molecular Toxicology students are required to attend two toxicology seminar series, each of which meets once per month during the academic year. The first “external” seminar series consists of presentations by outstanding toxicological researchers. Collectively, the Molecular Toxicology graduate students are responsible for selecting and inviting one "Graduate Students - Invited Lecturer" each year. The list of the speakers for this academic year is included in Appendix 9. These seminars are mainly funded by the NIEHS training grant. The second series consists of internal seminars presented by toxicology students and postdoctoral fellows. Trainees are required to both attend this seminar, and give a presentation each year in this series. One of sections A to E is chosen. These are research group meetings. Students give presentations to their research group members on their current research. Research group meetings occur weekly for about 1.5 hours. The overall goal of this course is to examine current literature in the field of toxicodynamics or mechanisms of toxicity. Recent primary literature in the field is presented by students, whereas review articles providing overview material are presented by the instructor. Unless the student has passed a course in epidemiology while an undergraduate or Master's student, he/she will be required to take an epidemiology course while he/she is studying for the doctorate in Molecular Toxicology. This course can be Epidemiology 100 or another epidemiology course that is relevant to the student's area of research interest. Students who have not previously taken and passed a course in Public Health at the undergraduate or graduate level are required to attend 6 Grand Rounds or any FSPH seminars outside of EHS over the course of 2 years. Students must meet with the Student Affairs Officer to discuss the requirements prior to attending their first presentation and document their attendance at each seminar by either signing the sign-in form for Grand Rounds presentations or submitting a summary of 100-150 words for each seminar to their faculty advisor. All students will obtain instruction in teaching skills by serving as teaching assistants for one quarter. This examination is usually taken towards the end of first quarter of the student's third year at UCLA. Both a written and oral qualifying examination is required. The written qualifying examination take the form of an NIH or NSF training grant application focusing on the student’s proposed thesis research. After successful completion of both the oral and the written qualifying examinations, the student advances to candidacy. A dissertation based on original research is required. The dissertation should consist of research equivalent to at least two peer-reviewed publications in reputable journals in the field.